Recently I decided to make some cocktails. 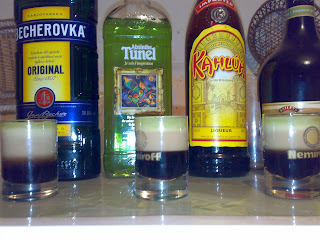 I had Becherovka and Absinthe and my friends had Bailey's and Kahlua. 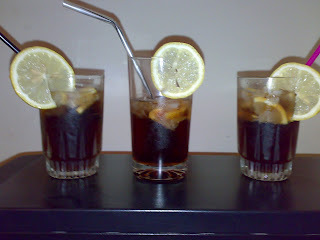 I decided to make B-56 and B-Cola. We need a glass which is used for Tequila. First of all we need to pour Kahlua. Then hold a tea spoon on the glass and carefully pour the Bailey's. Then without removing the spoon pour the Absinthe. Let's make a B-Cola. We need a glass with a volume of 250-300 ml. These cocktails were my firsts. Thanks for attention. Hope you liked them as I did.